I have an obsession with cocktail rings. Not an unhealthy obsession, mind you -- I just really, really, really like them. So when I came across the Gorjana Roosevelt Eternity Ring, my heart skipped a beat. 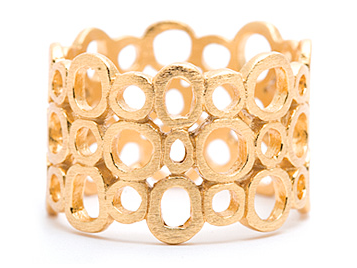 I love the interlocking stacked gold circles -- the design is so intricate and unique. This ring is going in my shopping cart and on my finger immediately! The Gorjana Roosevelt Eternity Ring retails for $65.